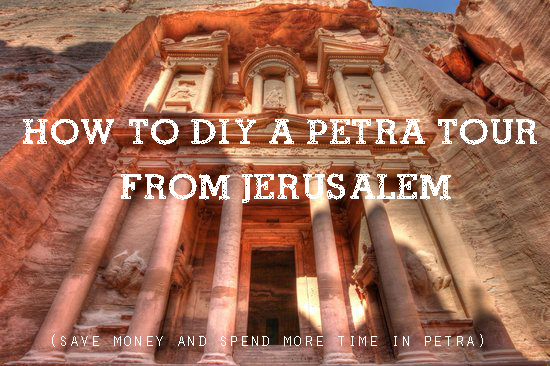 I’ve already written about how to DIY your way from Jerusalem to Petra, and about our visit to this incredible place; but I thought it might be a good idea to offer some tips and advice that came in handy for us, or that we learned from our experience. 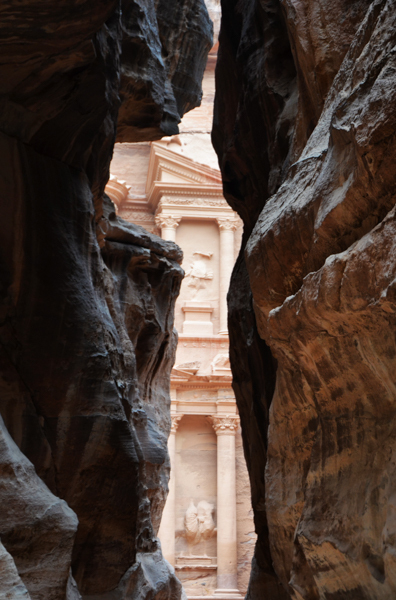 Right now is probably the best time to visit Petra. 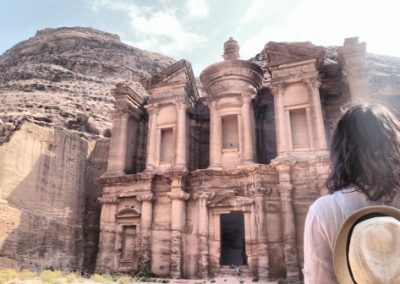 Since 2011, Petra has experienced a huge decline in tourism due to the Arab Spring and the issues going on in Syria, which Jordan shares a border with. 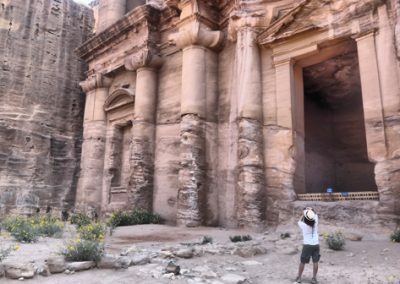 Unfortunately these issues have resulted in people choosing to avoid visiting Jordan, and so Petra is practically empty compared to how it was 5 years ago. 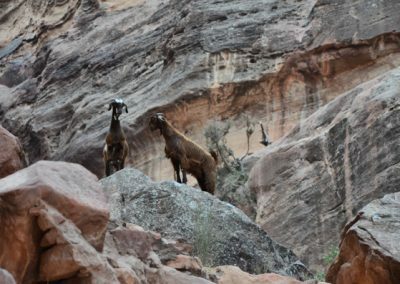 We found no evidence to suggest it was in any way unsafe to travel through Jordan, and in fact found our entire time here quite safe and laid back. 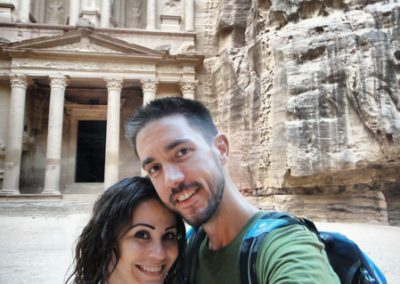 While this is quite unfortunate for Jordan and those in the tourism industry, it presents an opportunity for anyone who has wanted to visit Petra because hotel prices are lower, food and taxis are cheaper (or at least easier to bargain with), and the site itself doesn’t feel like a tourist trap heaving with bodies. 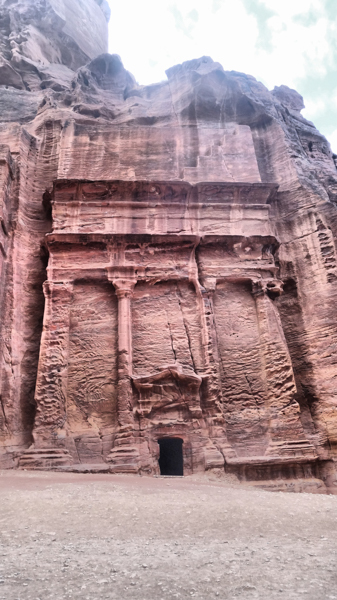 1 day is not enough to properly see Petra. Not only is 2 or 3 days a much better value, it also means you can take your time and avoid being there in the middle of the midday heat. 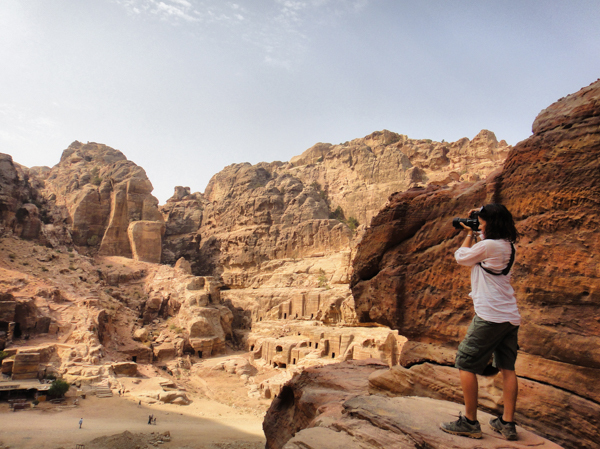 The site opens at 6am – it is absolutely worth arriving early at 6am, or even 7am, giving yourself 5 hours to explore before the midday heat becomes uncomfortable, especially given the amount of walking required. If you’re a lover of photography, an early start means you will have the opportunity to shoot the monuments without tourists in your shot, and you can comfortably take your time to set the shot. pro tip: take photos of the same monuments at different times during the day to see how the colours change. You do not need to purchase the official guided tour (which is 50JD, a fixed rate) – the information on the plaques is exactly what the tour guide provides. 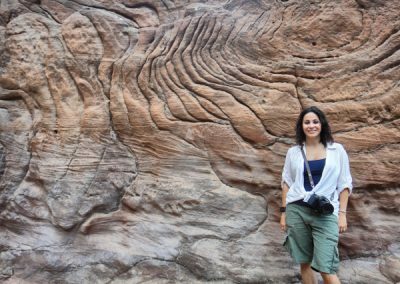 For a great self-guided walk, this site guide really explains what you’re looking at in great detail. 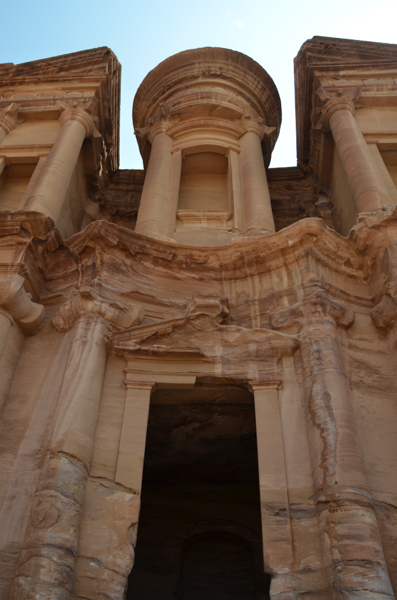 It’s impossible to visit Petra without seeing the Treasury, but it’s entirely possible to accidentally miss the Monastery – and that would be a mistake! 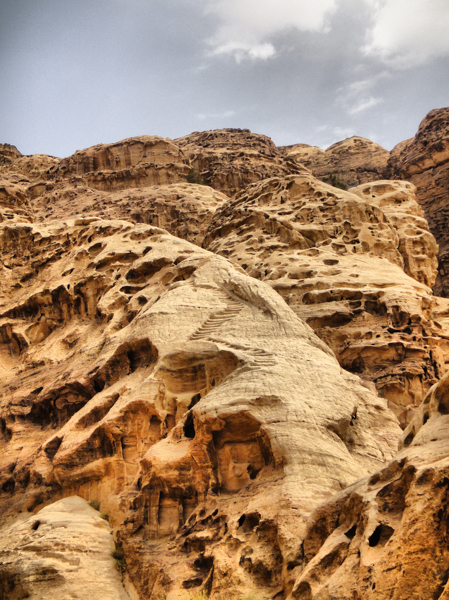 If you only have 1 day, be sure it includes a hike to the Monastery. 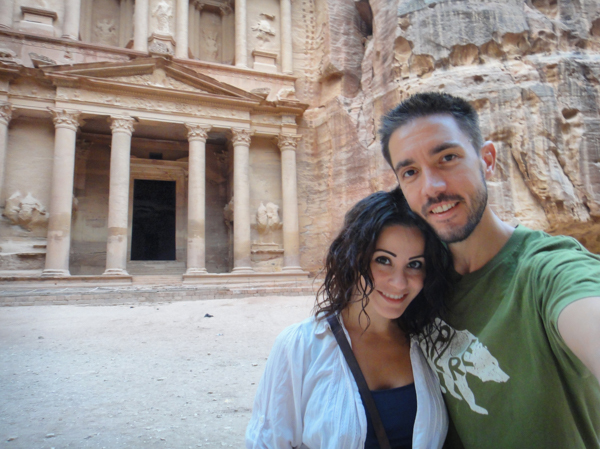 Petra by Night (17JD per person) is not worth the cost. It sounds like a great idea – but unfortunately with everyone using their phones as flashlights and constantly flashing their cameras, it completely ruins the mood. 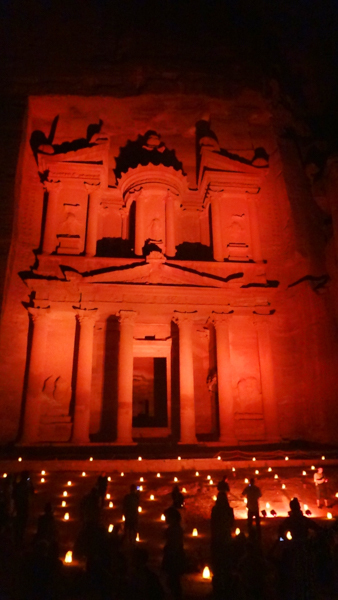 We spend 34JD to take one crappy photo of the Treasury lit by candles. Water. You’re in the desert, it’s going to get hot, and you’re going to be walking a lot. We drank 3 liters between the two of us in one morning. Hiking shoes. Please don’t wear sandals – we saw one lady wearing them and felt so bad for her. This is the desert. There is sand. and rocks. and dirt. You will be walking a lot. You will trip. 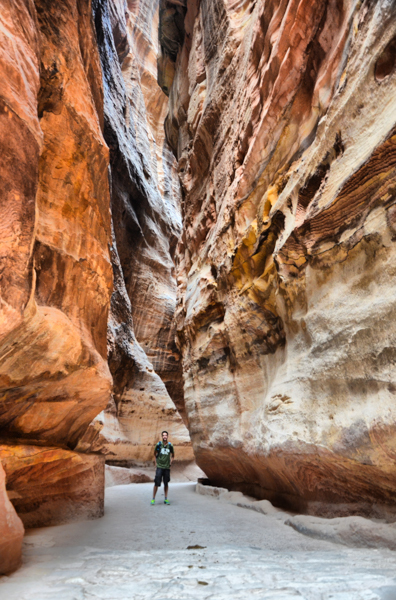 You will wish you wore hiking shoes. Packed Lunch. You don’t want to buy anything while inside the site. It’ll be ridiculously expensive and not worth the cost. Sunscreen, a hat, and/or an umbrella. Whatever you need to do to protect yourself from the sun – by 9am the heat starts to be noticeable, by 11 it’s just plain uncomfortable, and we can’t tell you about 1pm because we had the good sense to get out of there before then. Lens wipe. 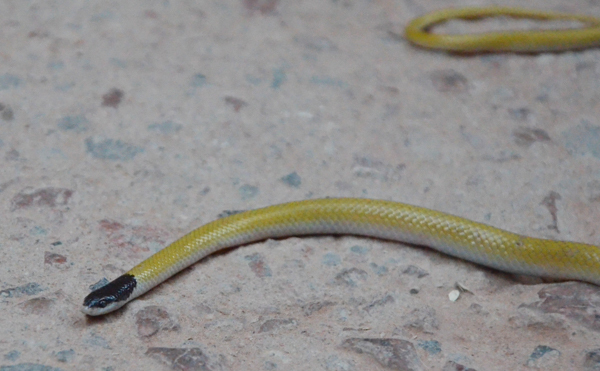 My DSLR stopped focusing because all the dust/sand in the air got inbetween the lens and the body. I had to take off the lens and wipe the contacts. The lens also got dust on it, so having something to clean the lens was essential. Bandaids. Both of us ended up needing them after 24km of walking over 2 days. First, let’s just get this picture out of the way. 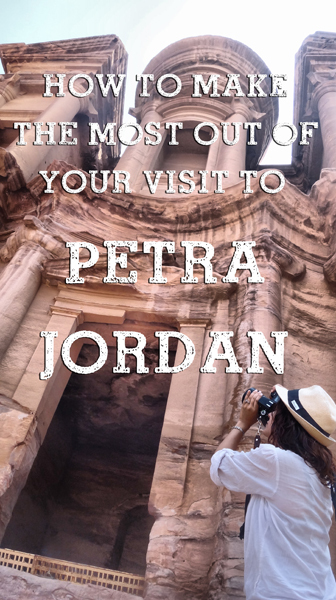 I can’t say for sure how long I’ve had Petra on my list, and I have no idea when I first even heard about the “Rose Stone City”. But what I can say for sure is that it was before I ever saw Indiana Jones and The Last Crusade – I know this because I saw that movie for the first time less than a year ago (I know). 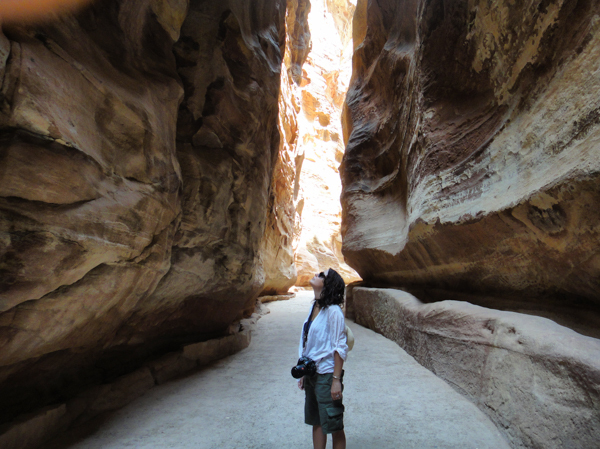 There’s something about 2000 year old cities carved into rocks in the middle of a desert that require you to walk through a narrow canyon crack for 2km before reaching them that just gets to me. It all seems so mysterious: how’d they do it? And why on earth did they pick this totally isolated place? And why did it get completely deserted (pun, intended) for so long? 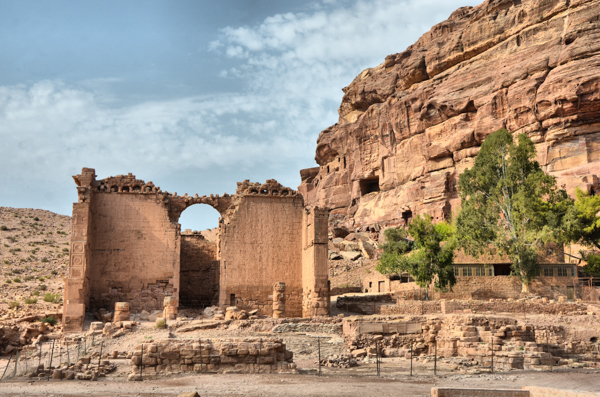 Petra was built by a tribe of Arab people called the Nabataeans, way back in 312 BCE. 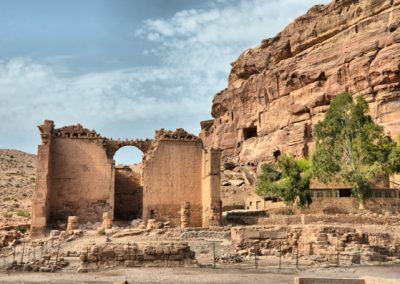 They actually chose that site because of its proximity to caravan trade routes, which led to the city becoming a major trading hub and brought them great prosperity. 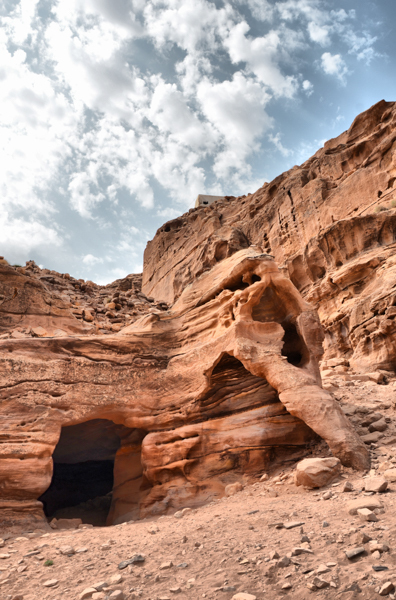 The Nabataens were quite the engineers – having created an artificial oasis by building aqueducts, dams and cisterns to make use of the flash floods that happened in the area, guaranteeing them a steady water supply during periods of drought. For me, the most mind blowing thing about Petra is that it was carved directly into the rock, 2,000 years ago, from the top down. 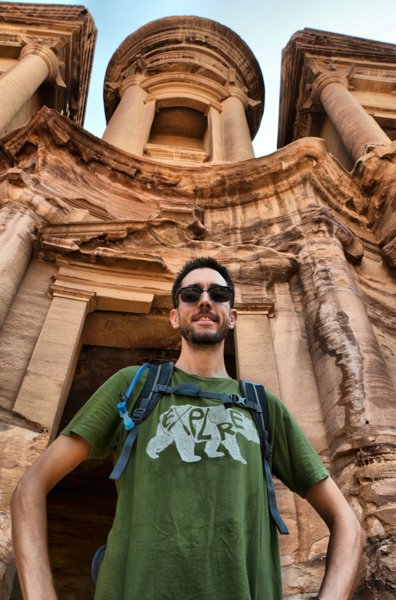 Arriving in Petra was a huge deal for me – it was a major bucket list item and ticking it off has felt awesome. Because of that, I didn’t want to spend just one day exploring the site. I had read up about it enough to know that the very minimum would be two days, and that you absolutely had to do the hike to the Monastery. 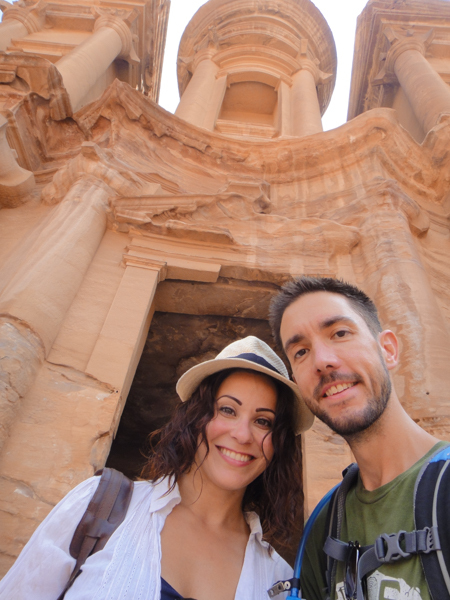 I’ve already written about how we DIY’ed our way to Petra from Jerusalem both to save money and to give ourselves more time in Petra, so this is more about our actual visit to the site. 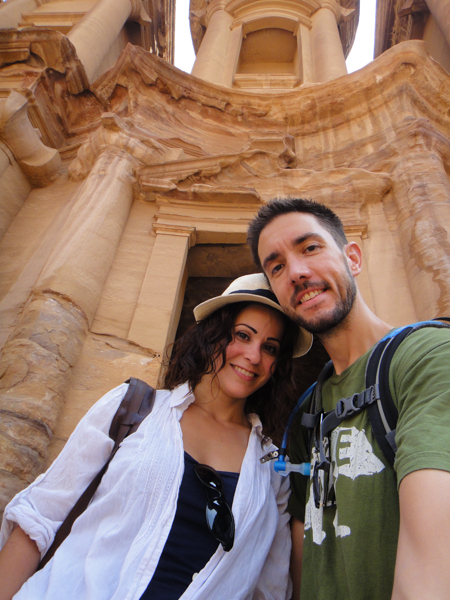 Over 2 days we visited Petra 3 times – twice in the mornings (once at 7am, and the following day at 6am, when it opened) and once at night for “Petra by Night”. For me the highlight was walking the 2 km through the “Siq” (Arabic for “The Shaft”), a narrow gorge (at the narrowest only 3 meters wide) made by water smoothing a natural geological fault split apart by tectonic forces – and catching the obscured glimpse of The Treasury, Petra’s most elaborate and famous ruin. 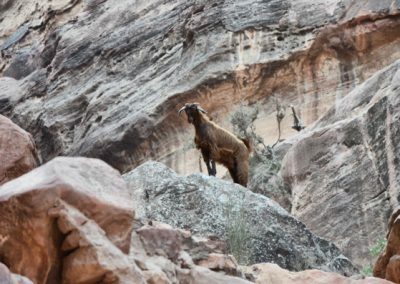 I knew that the walk would eventually lead us there, so every time we turned a corner in the gorge I thought I’d be coming upon that sight that I had waited so long to lay eyes on – only to find the path continuing to wind. It was an excellent build up, because when we finally came across the final bend and I spotted the rosy stones through the crack, I could barely contain my excitement. 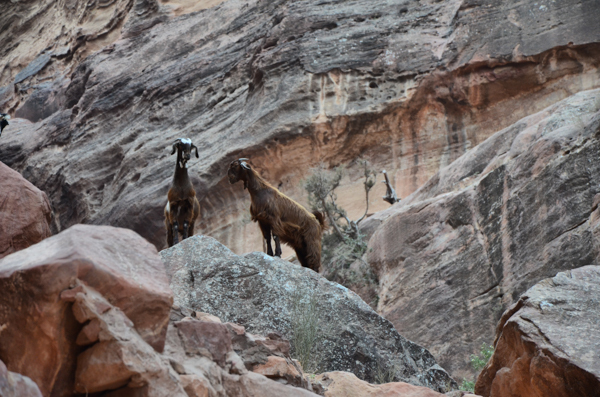 Naturally, since we had the place to ourselves save a few camels, we took the time to savour the moment and take several photos. 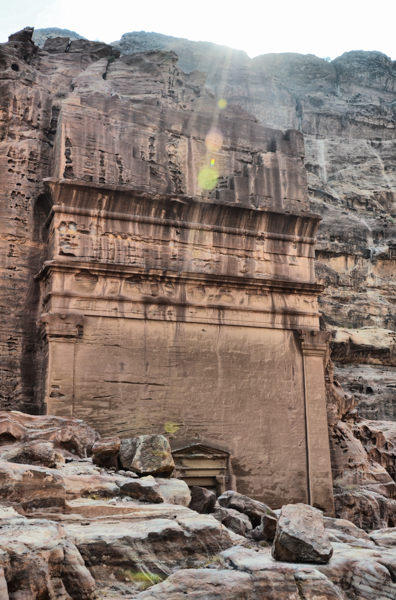 I can’t emphasize enough the value of visiting Petra bright and early when it opens. Not only does it mean that you’re exploring when the temperature is relatively cool (compared to the extreme heat you feel from 11am-3pm), but you also get the place virtually to yourself, meaning you can stop and enjoy the monuments, take it all in, and have beautiful photographs without a single soul in them. On top of the main site (which is HUGE), we did two hikes. On the first day we did the hike to the Monastery (and were grateful to be doing it at around 9am and finishing up just as it was getting hot); and on the second day we did the hike to the High Place of Sacrifice, with every intention of continuing on from there to the spot that overlooks the Treasury from the top of the mountain – except after an hour of wandering at the top of the mountain, we couldn’t find it and eventually called it a day. 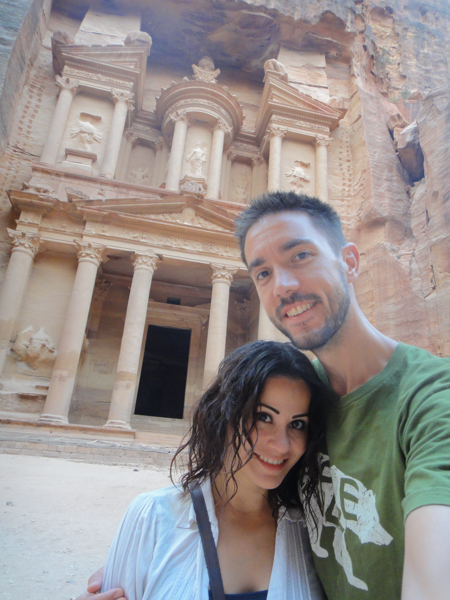 In addition to those hikes, we did a private guided tour and the “Petra by Night”, both of which we do not recommend. 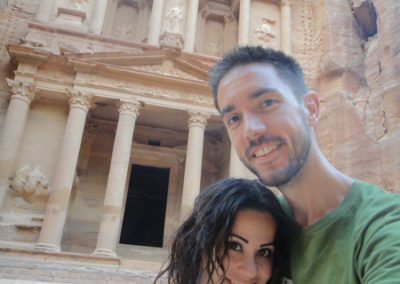 The Guided Tour: It cost 50JD (so roughly $100CAD) and is now in our top 3 worst tours we’ve ever done. Our guide didn’t tell us anything that wasn’t already clearly written on the plaques all over the site, and as we passed other groups on guided tours we heard far more interesting information being shared – we were bummed at flushing money down the drain and missing such interesting history. Petra by Night: It cost 17JD per person and while in theory is quite a cool idea (walking through the Siq to the Treasury with only the light of candles to guide you, arriving and listening to Bedouin music while sipping mint tea and enjoying the light of the candles and gazing up at the stars in the desert sky) the reality in this digital age was a ton of people with phones out using them as flashlights (ruining your night vision and any semblance of ambiance) and blinding you as you tried to watch the entertainment in the dark with all their lit screens. 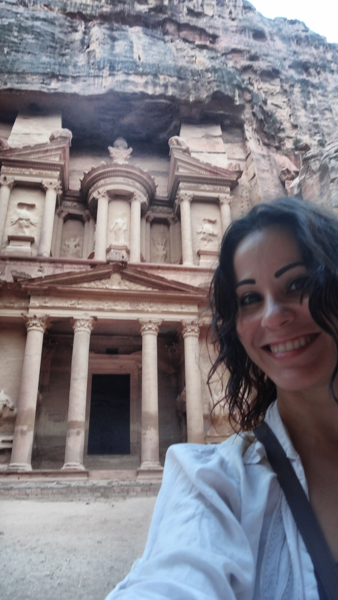 Out of our two hikes, The Monastery was absolutely my favourite. Not particularly strenuous – just a bunch of stairs carved into rock, you arrive from the side of the monument and only get to see it as you turn the corner, resulting in a combination of catching your breath whilst also having it taken away by the sheer awesome you’re now faced with. 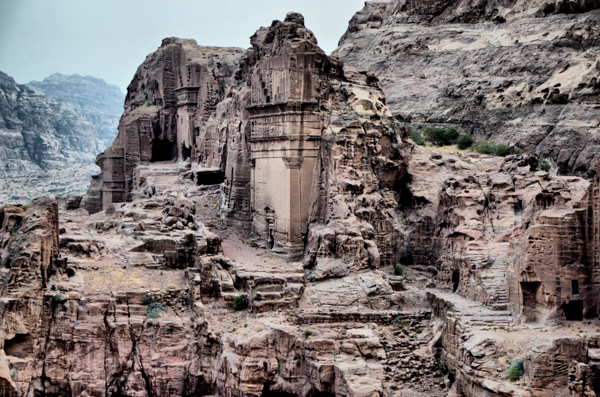 Second only to the Treasury in grandeur and fame, the Monastery has the added benefit of being on a top of a mountain, giving it seclusion as well as providing epic views, especially if you continue on to the several view points that stem from there. The High Place of Sacrifice wasn’t my favourite, but is absolutely worth doing if you have the time to do both. 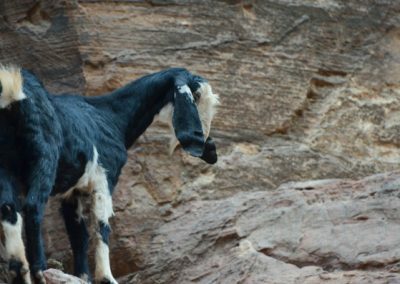 Along the route you’re likely to come upon mountain goats, which are fascinating to watch as they climb vertical rock with absolute ease. 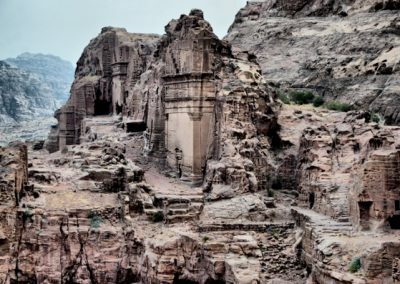 Arriving at the site you’ll find yourself at the very top of the mountain, looking at the remains of altars and what appear to be pools. 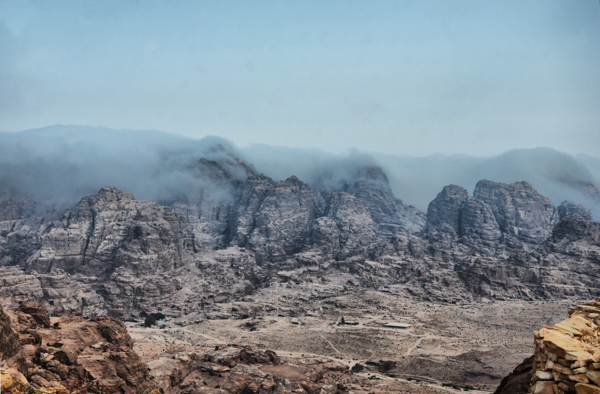 You’ll also find yourself facing another gorgeous viewpoint. 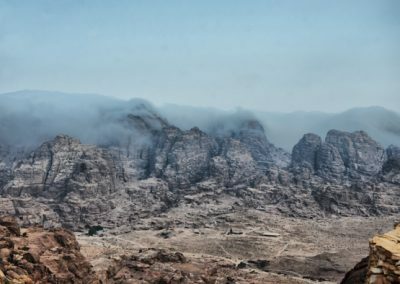 We had read this backpacker report mentioning a trail for a view above the Treasury, but unfortunately couldn’t find it, so we contented ourselves with admiring the skill of carving stairs into mountains, and the naturally occurring geological phenomena. 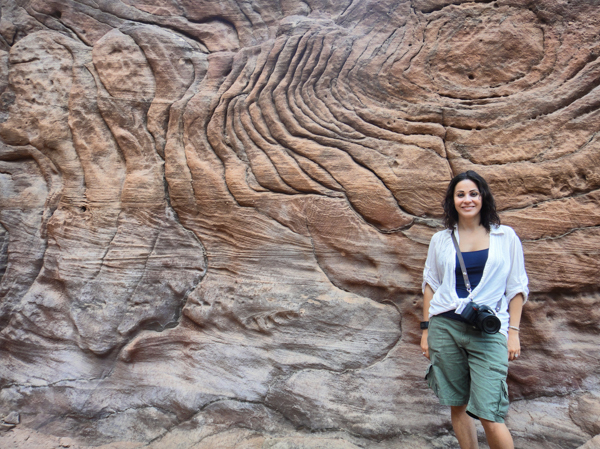 In total over the 2 days we visited the site we walked approximately 28km, with 5am-6am wake-ups, and it was wonderful. Everyone who knows us knows that Jordan is the hiker in our family, and I’m the one who begrudgingly accompanies him because, marriage; but he can attest that I was the instigator for the early start times and the uphill trudging (which he affectionately refers to as hiking) because this was a once in a lifetime opportunity and had been a long time coming – and I still feel like we barely scratched the surface of this mysterious place. 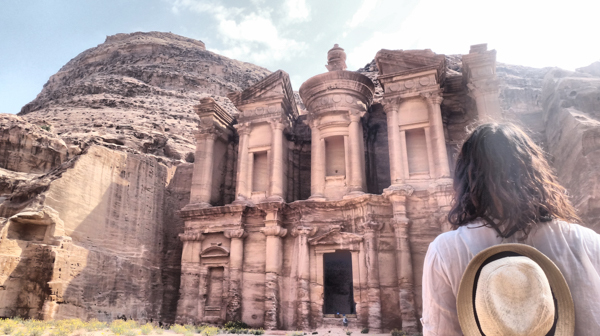 Petra has been a bucket list item of mine since forever – so there was no way we weren’t going to visit it, especially since we were in Jerusalem and they’re neighbours. So the only thing to figure out was how to get there. I looked at a lot of the tours to Petra from Israel. 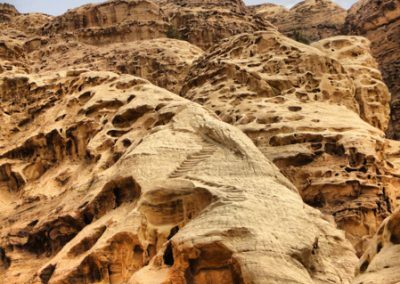 There are ones that leave from Tel Aviv, from Jerusalem, and from Eilat – all roads lead to Petra it seems, but they’re expensive! 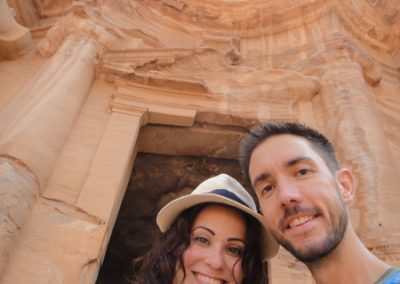 The most popular companies were selling 2 days, 1 night – with 1 day of exploring Petra for $384USD per person plus $45USD border tax, so $429USD. 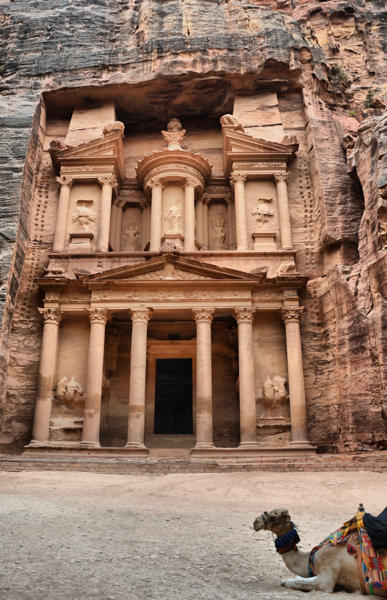 There were two problems with this – the first was that 1 day at Petra just wasn’t going to cut it. 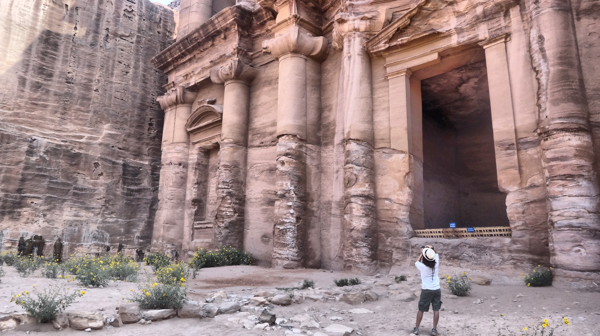 When you’ve traveled this far, spending only one day in the lost city seems an utter waste – you didn’t even get to see Petra by Night, which I had read about and looked amazing. The second was that $429USD is $557.98CAD – so that would have been $1,115.96CAD – over a grand for 2 days for both of us! 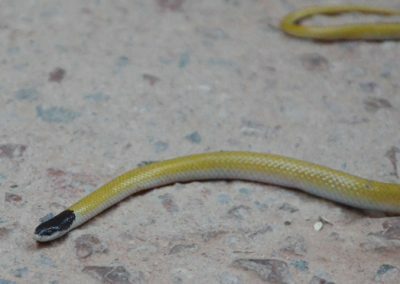 Ouchie. It had to be possible to do for cheaper. And so the research began. 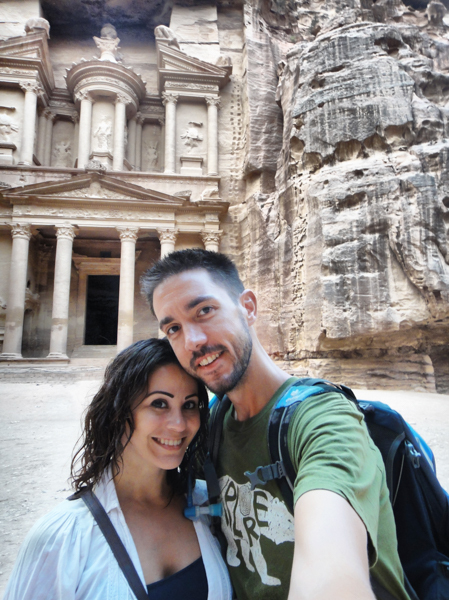 And whatdyaknow – we managed to get ourselves from Jerusalem to Petra, spend 3 nights in Petra (2 full days of exploring) for a whopping $281USD per person. 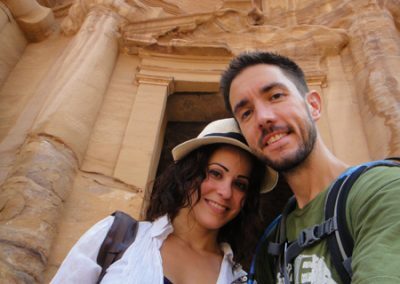 That’s $296USD less than the price of the tour (for 2 people), and we were staying in a nicer hotel for 2 more nights than the tour offered (the tour was sleeping in a camp), as well as getting 2 full days in Petra plus the Petra by Night experience. This is for 2 people. 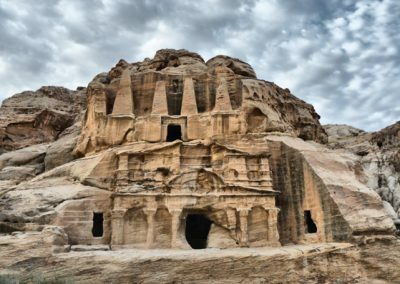 If you want to compare apples to apples and stay only 1 night in Petra, and spend only 1 day exploring Petra, the price will drop by over $100USD. If on top of that you’re up for sleeping in a camp or hostel instead of a 3 star hotel, it goes down by another $50USD on top of that. So instead of saving almost $300USD, you’d be saving $450USD, or in other words, instead of the prepackaged tour which costs $429USD per person, it would cost roughly $205USD per person. 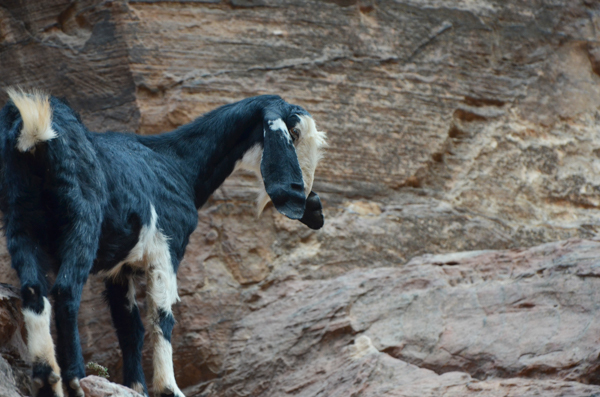 Many tours stop through Wadi Rum (the desert) as well. 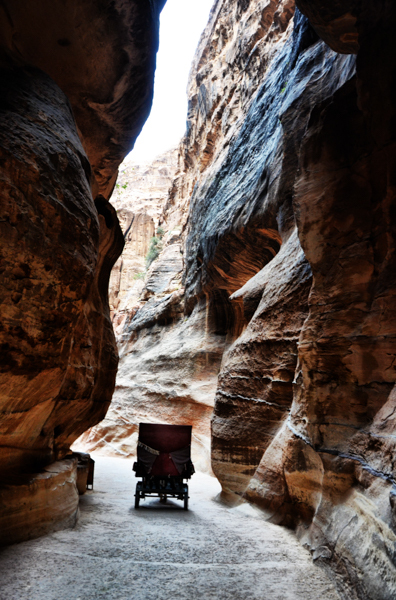 You can absolutely do this – it’s quite easy to get a taxi to drive you around the desert or arrange a few hours of 4×4 exploring once you get to Petra.